Drawing on both archives and museum collections management techniques, Archives Filmworks provides services that ready your 16mm films for long-term storage while providing the means to access their content through digital reference copies and descriptive data. What’s involved? Read on. . . Using gentle benchtop hand-wound film viewing equipment, we examine each film from beginning to end. This is when we do a physical assessment of the film: length, color and sound attributes, amount of shrinkage and warping, number and strength of splices, presence of tears and sprocket hole damage, and so on. We also look at the can (or, box or case), reel and leader and record any descriptive information they hold. All of this data is compiled in a curatorial report (see below). The inspection also includes the use of non-invasive Acid Detection Strips to determine to what degree the film is exhibiting destructive acetate film base degredation (also known as "Vinegar Syndrome," so named for its distinctive odor) -- this is important in determining the best storage environment for the film. We repair each film as needed and using tried-and-true film editing techniques. Each weak splice is replaced, new leader is added at the beginning and end of the film, and sprocket hole issues are resolved with notching or sprocket hole repair tape. These treatments are especially important as preparation for digitizing the film. Film is cleaned and conditioned with professional film cleaner, being careful to pay particular attention to edges and splices where grime can build up. Each film is stored on a 3-inch "core," a round hub around which the film is wound. The core supports the film without the use of a reel, the sides of which can damage film in storage. It is then placed in a new vented can that allows offgasses to escape. Both the core and the can are made of inert archival-quality polypropylene plastic by StiL Casing Systems. The film's head leader and the can's edge are labeled with the film's title or other repository identifier. Along with each film comes instructions for storage and a recommendation for an appropriate storage environment (for general storage recommendations, open the Storage of 16mm Film handout). 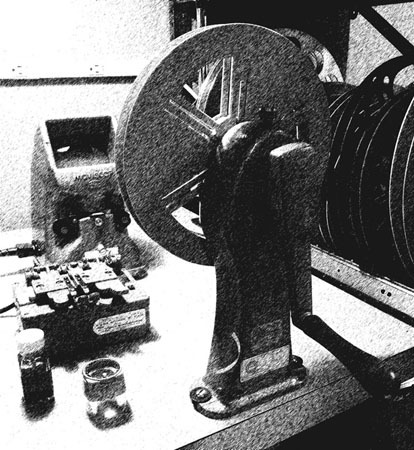 Films are digitized using a telecine projector, an analog-to-digital converter, and a computer. The projector, a Tobin Cinema Systems TVT-16, is outfitted with a single-CCD camera that captures each frame of the film at a speed of 24 frames per second (standard sound speed), along with any sound that might be on the film. This NTSC analog signal is digitized through a Grass Valley/Canopus ADVC-110 converter, and is captured as a digital file using AVID's Pinnacle Studio Ultimate in standard definition with an aspect ratio of 4:3. The resulting digital file uses an AVI wrapper and a DV codec, which is an open-source format and a good balance between quality and light compression. The AVI wrapper is currently the target format for preservation masters used by the National Archives and Records Administration. The files resulting from the digitization of some films look fine. But others, which exhibit the original film's fading color, variations in exposure or excessive splicing, can benefit from some adjustments to the digital file. Whether film-wide or scene-by-scene, we strive to make the end product as aesthetically pleasing and effective as a visual resource as possible, emulating the film's original look. We also use these techniques to bring amateur-made films and home movies to their authentic running speed of 16 to 18 frames per second. For their surrogate reference copies, we recommend that clients request at least one video DVD (Region 1) and one AVI file (using a DV codec) of each digitized film. More than one video DVD and files in other formats are often requested. For holding the files, we use professional-grade JVC/Taiyo Yuden silver inkjet-printable DVD-R disks. Disks come labeled and stored in inert archival-quality polypropylene book-style cases. Portable hard drive and Cloud delivery are also options; contact us for pricing. The curatorial report contains all the data that fulfills a cultural heritage institution's collections management needs. It catalogs the film as an artifact, as a document, and as a digital object. It also serves as a condition and preservation report, as it includes information about the film and details the work Archives Filmworks has done on it. For an example of a curatorial report, jump to the Curatorial Report Sample. For each job, Archives Filmworks maintains duplicates of the resulting DVDs and files for safe keeping. Clients may request additional copies for up to a year. In addition to the work on individual films detailed above, Archives Filmworks offers other services. Check with us for details and pricing.